Blog - BeSmartee - How Much Should I Expect to Pay in Property Tax? How Much Should I Expect to Pay in Property Tax? When you buy a house, there's a little (well not so little, really) expense you might not have thought much about: property taxes. These vary widely depending on many factors. The purpose of property taxes is to provide revenue for the local government, such as schools, the police department, the fire department, roads, parks, and any other municipal services. Even when you have your house paid off, you are still responsible for paying the property taxes on it. If you pay late, you'll probably be charged a fine. If you don't pay at all, you could lose your home. We'll explore what factors play a role in determining property tax bills so that you can figure out about how much you can expect to pay every year. Note that you might need to pay a county tax in addition to a city tax, depending on where you live. Your property has an assessed value. A tax assessor from your municipality assesses what that value is. If that sounds like a conflict of interest, well, that's because it is. Therefore, it's in your best interest to challenge your tax bill if it seems high. You would do so by getting a copy of the assessment from the office of the property tax assessor in your town. Look through it to determine whether the information on it is correct. Compare the assessed value to the home's market value. The assessed value should be close to market value. Be suspicious if it's much more. Once the assessor determines a value, the final number could be market value or it could be a percentage of that value. You can find out whether the taxed amount is a percentage of the assessed value and what that percentage is by checking with the assessor's office. That figure would then be used to determine your tax rate. Let's say it's 80%. If the assessor determines your home is worth $200,000, they would multiply that by 80% to give your home an assessed value of $160,000. If you find that the appraisal is too high, you can hire an independent appraiser to give your home a more accurate assessment. But you would need to pay for this. You can find a home appraiser at the American Society of Appraisers. Note that some municipalities won't accept an outside appraisal, so check first. Another method available to you if you think your appraisal is too high would be to contact the assessor's office in your town and ask what you would do to appeal your assessment. If your appeal is denied, and you know that you have a strong case, your next step would be to sue the assessor's office. The method local governments typically use to determine the tax rate is by the mill rate. One mill is one-tenth of a cent. So 10 mill would be 1%, 20 mill would be 2%, and so on. If your municipality's mill rate were 20 and your house is assessed at $200,000, your tax would be $4,000. Depending on what you might qualify for, you could shave hundreds of dollars a year off your property tax bill. Look at your tax bill to see whether you have a special assessment. This means you are being charged for improvements made in your area, such as road improvements. Your town might also have a local project for a park or school, and the town might ask its residents to fund this by paying more property taxes. You can vote yes or no on such issues. Property taxes vary widely, depending on where you live. For example, some states have no income tax and/or no sales tax. 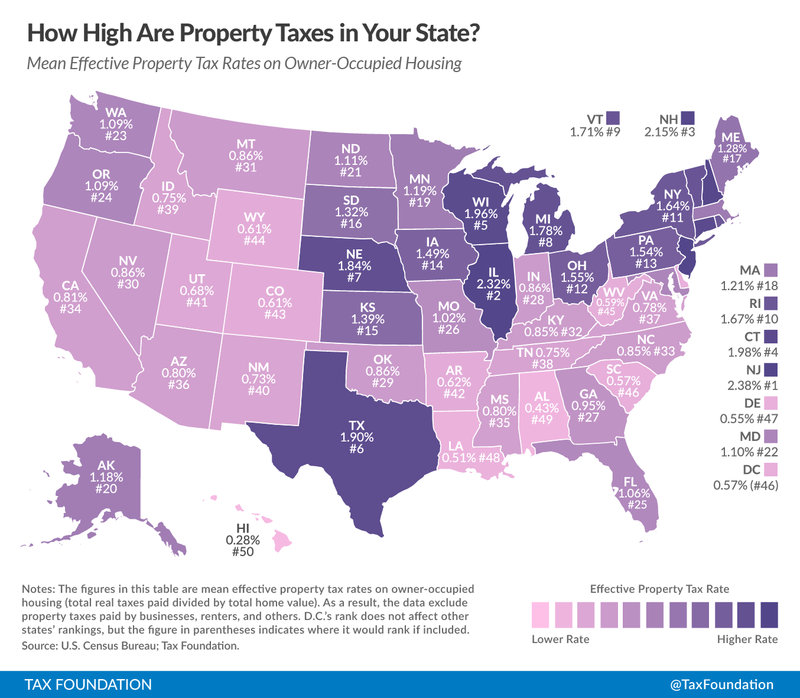 Those states sometimes make up for that by charging higher property taxes. Some states have high taxes across the board. It's interesting to know which are high-tax vs. low-tax states. It could be a determining factor in where you decide to live. As of 2016, the average household pays $2,127 every year on property taxes, according to WalletHub. Let's put this in some perspective. If you take the median home value of $176,000, and you use these figures to determine the tax rate you'd likely pay, if you lived in Hawaii, your tax bill would be $489. But if you lived in New Jersey, your tax bill would be $4,029. The IRS calls property taxes "real estate taxes." You can deduct real estate taxes you pay on your federal income tax if you itemize your deductions. You can also deduct school taxes, but you cannot deduct special assessments.